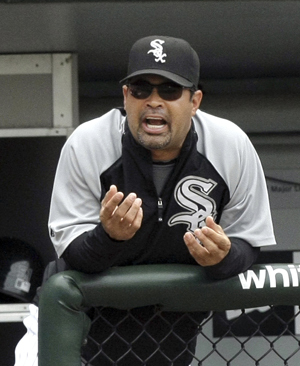 Chicago White Sox manager Ozzie Guillen was the voice of reason in the Joe Cowley controversy? Weird. Last Thursday the Toronto sports blogosphere was aflame with controversy over a web article written by Chicaco Sun-Times beat reporter Joe Cowley titled “No, Canada, for MLB”. In short, it was about how the Blue Jays are a moribund franchise that should be moved. As a Torontonian - born and bred -I had a very strong, knee-jerk reaction to reading this. After all, who is this guy? I don’t know him from Adam. Doesn’t he know that we’re the centre of the universe? Reading Cowley’s Wikipedia profile did little to mitigate my rage. I mean, who wouldn’t be inflamed when he “protests” Canada by refusing to stand during the national anthem? The two incidents make him appear ignorant and ethno-centric. However, after a day or two of reflection I calmed down. After all, Cowley clearly didn’t know what he was talking about. He was probably just trying to get a reaction from loyal Blue Jays fans. This morning, Cowley appeared on the Fan 590’s Big Early with Don Landry and Gord Stelleck where he defended himself admirably, pointing out that his infamous remark that Toronto was “nothing but a city in a third-world country” was taken out of context. However, Cowley stuck to his guns and reiterated his belief that the Blue Jays should be moved. He re-stated his beliefs that Venezuela deserves a team and that, aside from political reasons, it would work in Caracas, the capital of the country. Cowley had addressed this idea in his article, with supporting quotes from White Sox manager Ozzie Guillen and pitcher Freddy Garcia. Both Venezuelans spoke about how popular a team would be in Caracas. That’s entirely fair comment. It would be popular. Economically viable? No. Politically possible? No. Safe? Not even a little. But boy, there would be crowds. Ask any Winnipeg Jets supporter – drawing a crowd isn’t enough. You need the backing of a strong business community. Caracas lacks that kind of legitimate financial support. Also, let’s consider who he asked – two proud nationalists who, as fans, would undoubtedly love to see a major league team in their country. I can entirely sympathize. As a Canadian I love having a Major League Baseball franchise in my country, and am sorry that Montreal lost the Expos. Hell, if my heart had its way every major Canadian city would be represented in the National Hockey League and MLB. It just isn’t a realistic desire. It’s worth noting that neither Guillen or Garcia said that the Jays should be moved there or that the Toronto franchise should be moved at all. They just said that they’d like a team in Venezuela. Guillen did speak about how the dwindling fan support, compared to the Jays dynasty of the early 1990s, is a sad state of affairs. Again, I agree. It is sad. But the White Sox manager never explicitly said that the team should be folded or relocated. He was just commenting on the rather pathetic attendance figures. As for Rios’ and his claim that “There's that small group of diehards, but it’s hockey, hockey, hockey. It’s gotten sad here. They just don’t really care.” It’s hard to believe that he doesn’t have some resentment toward Toronto after he was put on waivers by the Blue Jays last season. Jays fans certainly don’t like him: he had been booed during each of his at-bats over the course of the four-game series. At the end of the day, I think Cowley’s article reads like a combination of someone with an agenda to push and someone looking for some cheap heat, trying to get a rise out of a beleaguered fan base to generate some hits for his web presence. In all honesty, I’m sorry to have wasted 639 words on this “news”. Cowley’s already gotten enough attention for his ill-considered article. As we have already debated this I’d like to throw this out there. I think the question of economics is overplayed by some of the major sporting leagues on this continent. I think the first and fore most question should be about being fair to the fans and not the owners. I also know that will never happen. Personally, I think that Rogers is holding the hopes and dreams of any baseball fan that currently resides in a city that does not have a professional team hostage by continuously pumping money into a team that doesn’t make them any. Rogers views the Jays for exactly what it is, a cheap marketing vehicle for its other lines of business. Believe me when I say that the millions they “lose” on the Jays is made up in the unpaid media exposure they get through the team. But in the end what’s the point? Attendence is pityful. Fan support is at an all time low. So let me ask the question, is playing to the 50,000 or so Jays fans in Toronto who come to games (talking buying a ticket, not part of a group or promotion) worth more to MLB then moving the team to a city like Tulsa or Memphis where hundreds of thousands would be passionate?